I’ve flirted with a number of different magazines since the demise of the BBC Vegetarian magazine many years ago. At first I used to buy occasional episodes of general food magazines like Delicious, Fresh and Olive, but when I became vegan that was a bit of a waste of money. I still used to get the Christmas and Summer BBC specials but they’re full of recipes I recognise from years ago. I tried a year subscription to the online version of VegNews and while I loved the recipes it’s too American and full of products I can’t get and I hate a few of the columns. I jumped for joy when Cook Vegetarian came out and subscribed for a year but soon became disillusioned with its worship of TV non vegetarian chefs, obvious recipe product placements, inconsistent labelling of vegan recipes and just general shoddiness. I think in one year I maybe made 3 things from it. Vegetarian Living was recommended to me by a friend but I struggled to find it in any shops locally. Curiosity got the better of me so I decided to take out a years subscription without even having seen it. I’m on my 4th issue now and I haven’t regretted it yet. It isn’t a vegan magazine but there’s a high proportion of vegan recipes and lots of vegan tips scattered about. My main criticism of it is that the tips are a bit samey – use vegan cheese, use vegan sour cream – I’d rather see some interesting nut, tofu or nutrtional yeast based substitutions – but I think that’ll come. There’s a clear index with vegan recipes clearly labelled. The chefs featured are interesting – for example, there’s an interview and recipes from Isa this month. It isn’t condescending and although there’s a healthy scattering of reviews of vegetarian beauty products and environmental issues, its focus is definitely food. There are good restaurant and product reviews, a page of cooking for children (though not dumbed down) and giveaways and special offers. And yes, there are lots of recipes I plan to try. I’m desperately hoping it keeps up the high standards it has set itself so far and doesn’t run out of ideas because I think I’ve finally found a magazine where I can stop flirting and snuggle up. 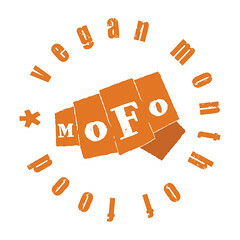 This entry was posted in Product review, Veganmofo 2010 and tagged Veganmofo 2010 by efcliz. Bookmark the permalink. I love food magazines! This one sounds really cool. I really should get a subscription to VegNews and Vegetarian Times again. I love reading food magagzine too! I seldom make anythign from any of them…..
I’m having a subscription to ‘Cook vegetarian’. And I’m also getting bored by it. There aren’t to many vegan contributions left anymore. I was also having my eye on ‘vegetarian living’. It looks better, more interesting people who are getting interviewed. But as Cook vegetarian is avalaible in the stores in Belgium, Vegetarian living isn’t and I don’t know yet if I want to go for a full subscription again. I totally didn’t see you’d posted this. I’m waiting for the mag to get back to me with a list of places who stock it locally so I can try a copy, but based on your review a it sounds like something I’d like anyway. Cheers! PS – Love your blog – long time reader, but rare commenter!